Are you getting sick of ordering takeout five times a week? Do you want to start cooking? Wish you were a better chef? Or simply looking to hone your skills in the kitchen? I used to HATE cooking. It seemed needlessly difficult, and a whole lot of work for not much return. It probably didn’t help that I was a terrible cook! Thankfully, I’ve honed my skills and now cooking is one of my favourite things to do. In fact, I recognized all the reasons to love cooking and made it my mission to improve. Here are three easy ways to start cooking. This is the best advice I could give to any budding chef! Like any skill, starting with the basics and building on that foundation will not only grow your skillset, but will give you the confidence needed to be successful. While it can be tempting to try an extravagant recipe, my recommendation is to choose 1-2 easy recipes per week. Find something that looks to be relatively simple, fast to prepare, and doesn’t require many ingredients. If you can find one of your favourite foods to make, even better! (Psst… you can check out some of my favourite food blogs in The Best Recipe Sites for Healthy and Delicious Meals). You can learn pretty much anything from YouTube and cooking is no exception. If you’re a visual learner like me, watching someone demonstrate how to do something is way easier to digest (no pun intended!) than reading about it. I love the healthy recipes featured on Buzzfeed Goodful, and this handy list of 10 YouTube channels that inspire you to cook has some additional ideas. If you’re going to be pausing and playing videos often, I recommend investing in a tablet stand or phone stand to make your screen easy to see and take up less space. You can also grab a screen protector to keep your devices clean! Sign up for an ingredient-and-recipe meal kit subscription. If you haven’t heard of ingredient-and-recipe subscriptions, you’ve been missing out! Companies deliver (pre-portioned!) fresh ingredients and recipes to your door every week. This lets you focus solely on preparing delicious meals. No meal planning, shopping, and measuring required. Just follow the instructions and start cooking a wide variety of recipes. While these seemed to start popping up a few years ago, nowadays there are several big companies offering great subscriptions. Here are a few of them. In May 2015, I tried Chef’s Plate for the first time and can confidently say that it’s the number one reason I love cooking today. As I mention in my Chef’s Plate Review, their recipe cards provide detailed, step-by-step directions and after cooking with them for a few weeks, I felt more comfortable in the kitchen and became familiar with many techniques. In fact, you can see me in action cooking one of their meals in my Chef’s Plate Vlog! If you sign up through my link, or use promo code #3platesFromBeyondTheSafeHarbor you can actually score your first 3 plates for FREE! That’s one additional plate free versus signing up on your own. If you don’t live in Canada or are looking to try a different subscription service, don’t fret! Here are some others. We recently tried HelloFresh for a few weeks and really liked it! Read all the details in my full review. Check below to see if they operate in your country and use the links to score some savings! Blue Apron is the grandfather of ingredient-and-recipe subscriptions and services almost the entire United States! Since I live in Canada, I haven’t been able to try their boxes but if you live in the U.S. you can get $30 off your first order by signing up through those links. 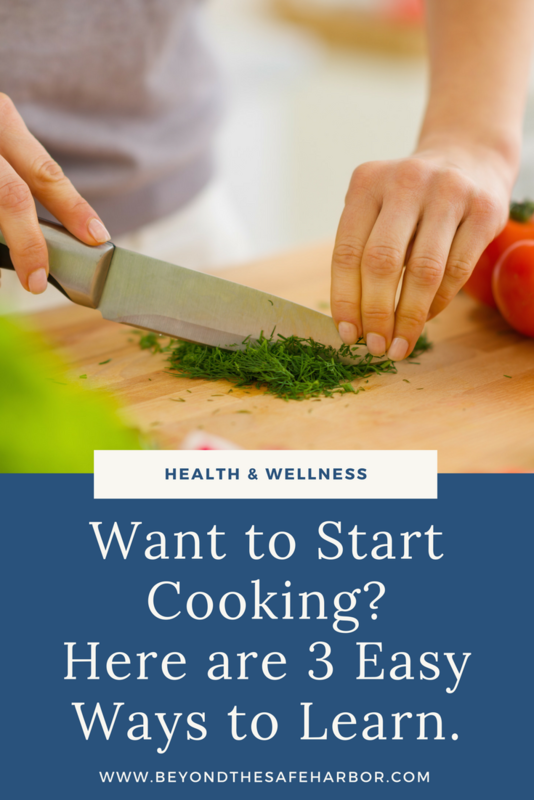 So there you have it – three easy ways to start cooking! By starting small, watching step-by-step videos, and using a meal kit subscription service, you can lower the learning curve and make the process a whole lot more fun and enjoyable.